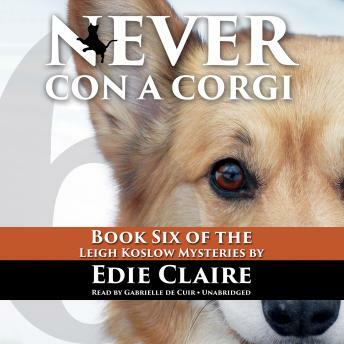 Leigh’s back in this sixth installment of the Leigh Koslow Mysteries. Hapless advertising copywriter Leigh Koslow, who was last seen joyfully announcing to her politician husband that she was pregnant, is now a middle-aged mom who is more than happy to leave the macabre pandemonium of her thirties behind. Unfortunately, Leigh’s killer karma hasn’t really deserted her; it’s only been biding its time. When an innocent walk in the woods with her dog turns up a corpse, Leigh begins to get worried. It’s bad enough that the victim is a client of her agency. It’s even worse that he’s the same unscrupulous real estate developer who’s been conniving to bulldoze her aunt Bess’ homestead. And it would be a whole lot better for everyone in Leigh’s family if her cousin Cara’s husband hadn’t brawled with the man in front of a church full of witnesses an hour before the murder. But fate is what it is, and as Leigh’s beleaguered friend, Detective Maura Polanski, sets out once again to save the Koslow clan from self-destruction, the women face their toughest battle yet, because not only has Leigh failed to outgrow her inborn talent for trouble, she’s bestowed it on the next generation.